This is a delicacy eaten in the hot summer. Just looking at is supposed to make you feel fresh. Mizu Yookan (mizuyokan 水羊羹) is made from red bean paste, but there are other types now made with sweet potatoes or other ingredients. It is served on the green leave of a cherry tree. It is a traditional sweet, easily made at home too, and just the mention of the name makes you feel fresh again on a hot summer day. Farmers use freshly cut bamboo and stuff it in the tubes, then hang it in the local river for cooling (in times you had no refrigerator...). As the summer gets hotter and hotter, people like to eat chilled and light-tasting sweets such as Mizuyokan (水羊羹). Mizuyokan is a watery version of Yokan, a rectangular bar of sweetened jellied bean paste available in different flavors, and served with tea. Yokan has a history going back hundreds of years. It was originally brought from China by Zen monks between the years 1192～1573. At that time Yokan was eaten as a vegetarian substitute for the thick mutton soup traditionally served between meals (known as tenshin). Zen monks were forbidden to eat meat, so they made meat substitutes using mashed beans and powdered kuzu root (kuzuko: Japanese arrowroot). With time, the popularity of Yokan gradually spread to the military (samurai) world as well, and it was often served during religious ceremonies and memorial services for the dead. At that time sugar was a precious ingredient, so Yokan did not have the sweet taste it has now. At ceremonial meals people ate Yokan served with with slices of pear or sashimi (raw fish) which seems unthinkable now. 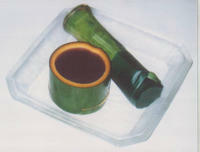 During the 16th century, Yokan began being used for tea ceremonies. As sugar supplies increased during the Edo period, Yokan started being produced as a dessert rather than food eaten between meals. In the 18th century Yokan began being produced as merchandise, wrapped in bamboo leaves. The process of Yokan production during that time period is similar to the way that steamed Yokan (Mushiyokan) is made now. 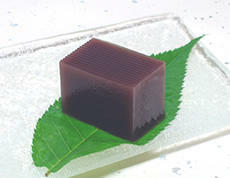 Mizuyokan was created by making steamed Yokan using Kuzuko in place of wheat powder and a larger quantity of water, creating a jelly-like texture. It took a while for the recipe to be perfected, so it was not until the 18th century that it caught on in popularity. In 1789-1801, Neriyokan (Yokan paste), began being made in the Edo region (Tokyo), using kanten (agar- a jelly made from seaweed) to make it firm. This became popular, and spread all over Japan. Neriyokan was more popular than steamed Yokan because it kept well and was better tasting. It thus became the main Yokan product on the market. Mizuyokan made with kuzuko tastes smoother than the kind made with kanten, but is more difficult for mass production and does not keep as well as the kanten variety, so the latter tended to dominate the market. In modern times, packed and canned Mizuyokan can be easily preserved, but are not as aesthetically pleasing as fresh sliced Mizuyokan placed on real cherry leaves or packed in a real bamboo container complete with bamboo leaves on the top. 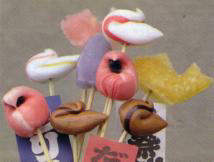 Many sweet shops sell original Mizuyokan in a variety of tastes, shapes and colors. So why not give Mizuyokan a try this summer? 1. PREPARE AHEAD: Place the drained, cooked beans in a 4 quart pot. Add 2 quarts of cold water and, over high heat, bring to a boil. Reduce the heat to its lowest point and cook uncovered for about 3 hours, or until the beans are very soft. 2. Pour the beans into a coarse sieve set over a large bowl and puree them by rubbing them through with the back of a large spoon. Transfer the puree to a very fine sieve set over another bowl, and rub them through again. 3. Wrap the pureed beans in a kitchen towel and twist to squeeze them dry. The beans may be refrigerated, tightly wrapped in the towel, for as long as 4. TO COOK: In a 1-1/2 to 2 quart saucepan, stir together the gelatin, sugar and salt. Pour in 2 cups of cold water and bring to a boil over moderate heat, stirring constantly. Add the pureed beans and return to a boil, still stirring. Then pour the beans into an 8" cake pan, cool and refrigerate overnight or until firm. Slice into 2" wedges and serve as dessert or a swee course. Original recipe from "Recipes - The Cooking of Japan"
. Donryuu Yookan 呑龍羊羹 Donryu Yokan sweets . My essay about some Japanese sweets, with Daruma as the main ingredient!
. 鍾馗羊羹 Yokan with Shoki, the Demon Queller .